We may collect personal information from you such as your name, email, IP address, etc. We will never sell or share that information with anyone. This site may use “cookies” to enhance your visits; however, you can change your browser settings to refuse those cookies if you so desire. Please note that refusing or deleting cookies may affect the performance in some areas of this blog. We use appropriate data collection, storage and processing practices, and security measures to protect against unauthorized access, alteration, disclosure, or destruction of your personal information, username, password, and data stored on the site. We always consider your rights before processing Personal Data. Our processing activities have lawful grounds, and we will provide you information regarding that processing upon request. We will not store your personal data for longer than needed, and we will not more than the minimum amount of data required for any purpose. We will do our best to ensure the integrity and confidentiality of data. Processing – any operation(s) performed on Personal Data or sets of Personal Data. We/us (either capitalized or not) – https://www.TouchingtheHemBook.com. Information automatically collected about you. This includes information that is automatically stored by cookies and other session tools, such as your IP address. This information is used to improve your customer experience. When you use our services or look at the contents of our website, your activities may be logged. We do not intend to collect or knowingly collect information from children, and we do not target children with our services. to offer products/services that are similar or same to your purchasing history/browsing behavior. We reserve the right to anonymize Personal Data gathered and to use any such data. We will use data outside the scope of this Policy only when it is anonymized. We save your billing information and other information gathered about you for as long as needed for accounting purposes or other obligations deriving from law, but no longer than is absolutely necessary. Personal Data about you is, in some cases, provided to our trusted partners in order to either make providing the service to you possible or to enhance your customer experience. We share your data only with trusted third-parties, and will only work with processing partners who are able to ensure adequate level of protection to your Personal Data. We disclose your Personal Data to third parties or public officials when we are legally obliged to do so. We might disclose your Personal Data to third parties if you have consented to it or if there are other legal grounds for it. Right to data portability – you have the right to obtain your Personal Data in a machine-readable format or, if it is feasible, as a direct transfer from one processor to another. Currently we operate an ‘implied consent’ policy, which means that we assume you are happy with this usage. If you are not happy, then you should either not use this site, or you should delete the cookies having visited the site, or you should browse the site using your browser’s anonymous usage setting (called “Incognito” in Chrome, “InPrivate” for Internet Explorer, “Private Browsing” in Firefox and Safari, etc.). Necessary cookies are required for you to be able to use some important features on our website, such as logging in. These cookies don’t collect any personal information. Functionality cookies provide functionality that makes using our service more convenient and makes providing more personalized features possible. For example, they might remember your name and e-mail in comment forms so you don’t have to re-enter this information next time when commenting. Analytics cookies are used to track the use and performance of our website and services. We are committed to safeguarding your privacy. 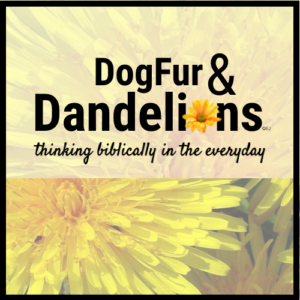 Contact us at elizabeth.johnson@dogfuranddandelions.com if you have any questions or problems regarding the use of your Personal Data and we will gladly assist you.